Pope Francis has now returned to Vatican City, but we remain inspired and moved to action by his words and actions during his visit to the U.S. and the U.N.
As Chairman of the Committee on International Justice and Peace, I would like to recall some of his powerful international challenges to our nation and world in his own words. 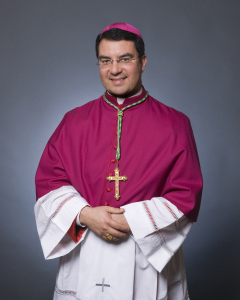 Most Reverend Oscar Cantú is the Bishop of Las Cruces and Chairman of the USCCB Committee on International Justice and Peace. Learn and reflect on what Pope Francis has said on various occasions on peace and social justice issues such as care for creation, charity, the death penalty, life and dignity, migrants and refugees, and poverty. Read USCCB’s compilation of quotes (pdf) from Pope Francis from throughout his papacy, including his recent trip to the United States.